Winston is a very handsome 2 year old male Bulldog. He is active and exuberent and very people oriented. 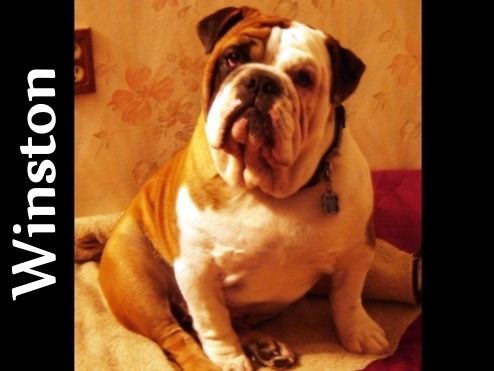 Winston is a very handsome 2 year old male Bulldog. He is active and exuberent and very people oriented. He tends to be a bit overbearing if he can get by with it. He gets along with the foster's young Boxers, but is not tolerant of the older dogs at all. Winston would do well with a very active home with Bulldog experience that will commit to doing some Obedience Classes with the boy. He would be best as an only dog! Winston is housetrained, crate trained (but should be crated when not supervised). He tries to be a good boy, and with a family that will love him, but enforce reasonable rules, Winston will be a very happy boy. No children under the age of 10 as he is active and still clumsy and will knock over smaller children and gets very excited with young children. Please have an Application to Adopt on file. We ONLY adopt within a 1 hour radius of St. Louis MO. Adoption fee, reference check, home check and vet check apply.